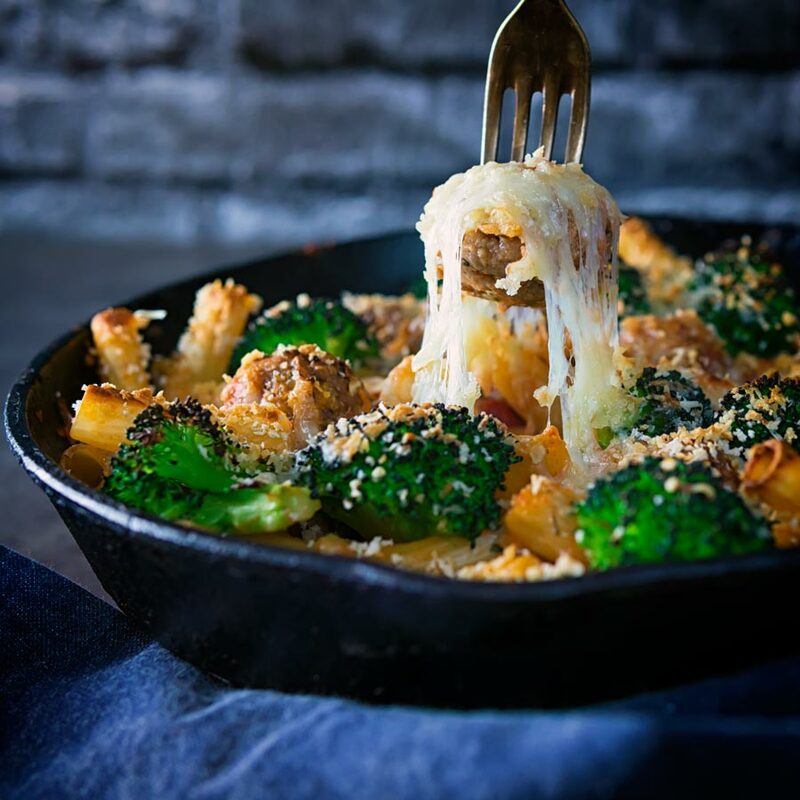 A pasta bake is such a comforting recipe and this turkey meatball pasta bake is gloriously tasty, cheesy and very very comforting! Pasta bake recipes are a huge tick in the box for comfort food heaven. Cheesy goodness all baked in the oven that is easy to scale up and down make it a cooks and eaters delight. My turkey meatball pasta bake recipe is our current go-to favourite. It contains simple flavours with no surprises but comes together to create a fantastic meal that will leave you begging for more. You can easily swap out turkey meatballs with chicken meatballs in this recipe. If you wanted to go for pork or beef then you should be a little more aggressive with your choice of cheese. 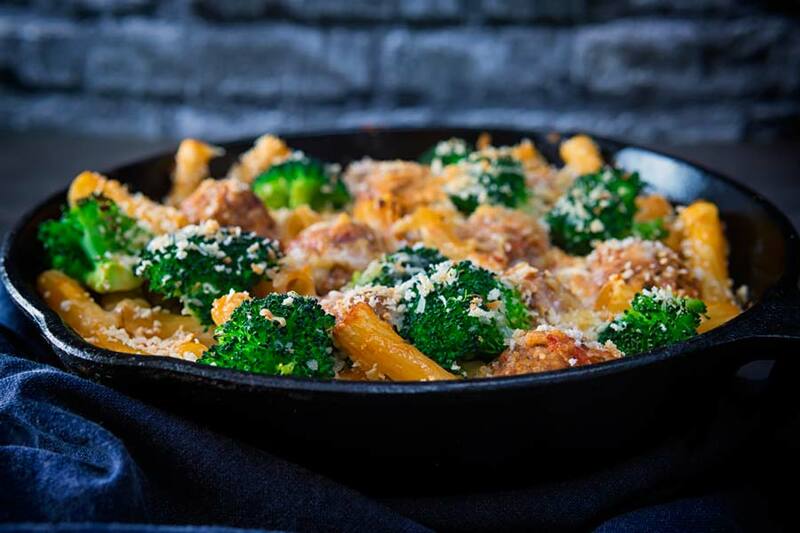 I use sweet and nutty gruyere cheese for this meatball pasta bake. It is a wonderful hard swiss cheese that melts beautifully and has a great flavour that is not too pervasive. I use it in dishes as diverse as pasta bakes through to my leek quiche and in the polenta that I serve with my Italian Sausage Ragu. What Pasta To Use In A Pasta Bake? For me, the key to choosing the right pasta for a pasta bake is in how robust it is. No one likes slimy, soggy pasta, so go for something with some body and structure. I like to use penne or rigatoni. The extra structure and bulk will prevent it from overcooking in the oven. You could also go for something like orecchiette, but avoid pasta like fusilli or farfalle. They are often too thin and the overcook far too easily. My next hint is to ensure that you undercook the pasta before it goes into the pasta bake. A minute to 90 seconds is enough to buy you a little extra time. Finally, avoid quick cook pasta… Friends do not let friends use that slop, it is awful in anything. But it will genuinely ruin your pasta bake, turning it into a flabby mess of awfulness. Seriously you are saving like 5-6 minutes, it is not worth it! As with all pasta bake recipes you can prepare this recipe to the point before it goes into the oven and cook later. Cooking In A Cast Iron Skillet. I love cooking in a cast iron skillet, the way that it absorbs and distributes heat is wonderful. It is also really versatile switching from gas to induction and oven to grill or bbq with no problems. My cast iron skillet has been with me for many many years. It was a Christmas gift from an Aunt in either my late teens or early twenties. Yes, it has been with me that long, I have no idea what make it is and it doesn’t matter to be honest. They are nothing more than cast lumps of iron and you can’t go wrong with them. Drop them and they will break what you drop it on. Mistreat them as you will, the worst that will happen is that you will need to strip them and re-season. Cleaning them is a dream, hot water, wipe it off and job done. How I will not comment as to whether we eat directly from the pan for this meatball pasta bake. 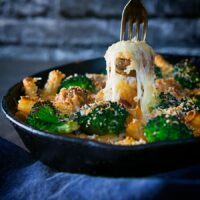 But just like my cheesy skillet gnocchi or stuffed pasta shells you most certainly could! Mix together all of the ingredients for the meatballs. Form the meatball mix into 10 meatballs and set aside. Heat a skillet over a medium heat and whilst it is warming finely dice the shallot and the garlic clove for the sauce. Add the oil to the skillet and then cook the shallot and the garlic for 5 minutes. Chop the sun dried tomatoes for the sauce and add them to the pan with the canned tomatoes, oregano and season to taste with salt. Add the meatballs into sauce and poach for 10 minutes rotating in the sauce occasionally. Whilst the meatballs are simmering cook the pasta in boiling water for a minute less than it says on the packet. Meanwhile cut the broccoli into florets and grate the cheeses. Remove the pasta from the boiling water with a slotted spoon and add to the meatballs and sauce and mix, it helps to do this in a large bowl. Mix in three quarters of the tow cheese and again mix. Place the broccoli florets in the boiling water and cook for two minutes. 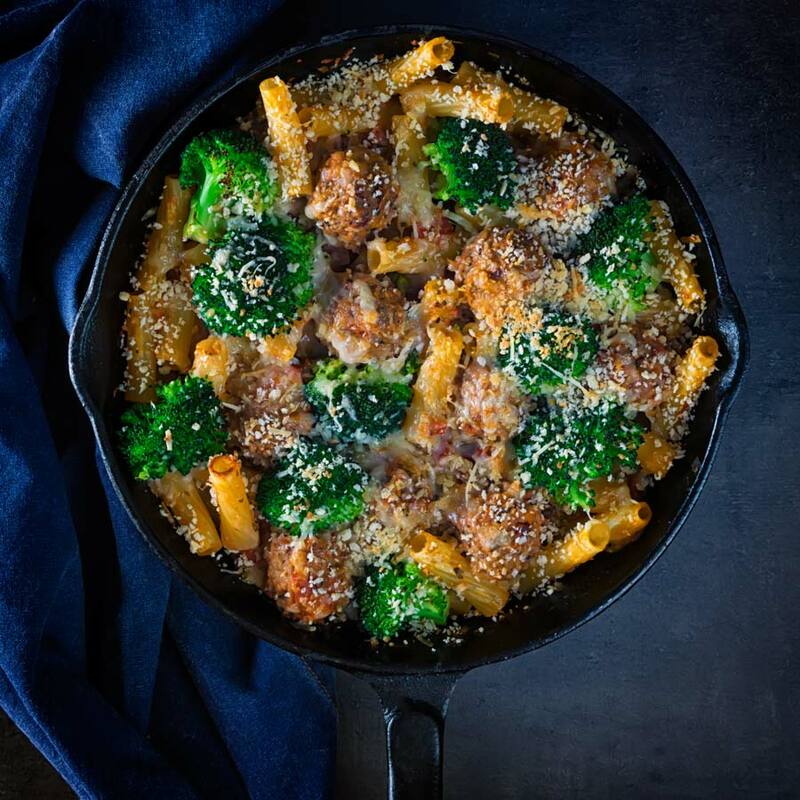 Drain and refresh the broccoli and then arrange the pasta, meatballs, broccoli in the skillet. Sprinkle with the remaining cheese and breadcrumbs. Place in the oven and bake for 20 minutes at 180°C or 350°F. What a delicious looking pasta dish. I would love to try this. Thank you Jemma, it is super simple! What a delicious looking pasta bake! We’ve been eating a lot of turkey recently and I just know that the kids would love this dish! It is definitely a crowd pleaser. This looks like a truly delicious pasta bake. 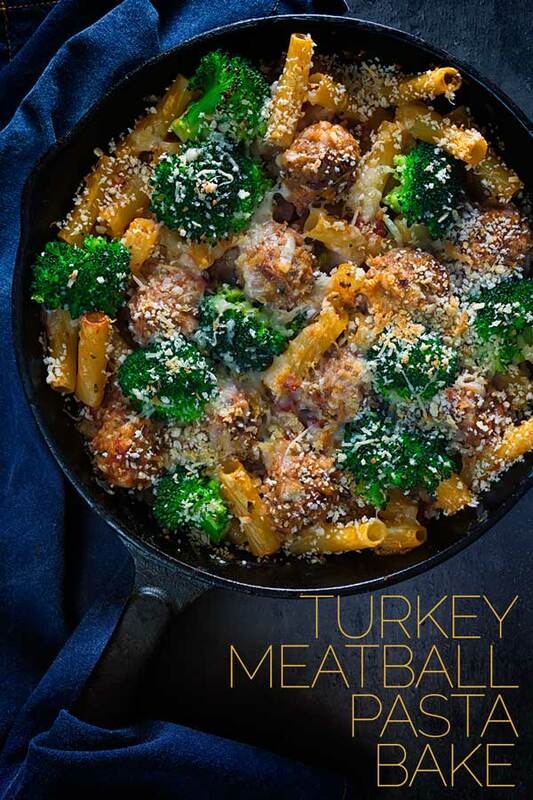 I’ve never used turkey meatballs with pasta. Must try it! I LOVE a good pasta bake because they’re so easy to put together and are so comforting. This sounds amazing!